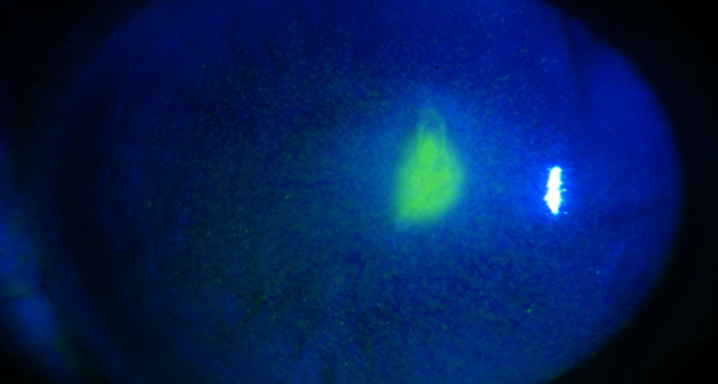 Recurrent corneal erosions normally appear in eyes that have suffered a sudden erosive or piercing injury (nails, paper cuts, tree branch, etc.) or in eyes with pre-existing epithelial basement membrane dystrophy. Superficial injury causes epithelial abrasion that can be quickly cured without leaving any clinical signs of the injury. After a variable period of time lasting days or years, the symptoms return suddenly without any evident cause. Characterised by initially sudden eye pain at night or on waking, accompanied by reddening, light sensitivity and watery eyes. Each episode can vary in intensity and duration. Conservative treatment in the acute stage consists of frequent lubrication with antibiotic and cycloplexic ointments, followed by the use of lubricants without preservatives or a hypertonic saline solution during the day and ointment at bedtime for 6-12 months, in order to encourage correct epithelial insertion. Therapeutic contact lenses can be useful in some cases although such treatment must be appropriately monitored. When conservative treatment cannot control the symptoms, the most suitable surgical treatment is recommended. Phototherapeutic keratectomy (PTK) using an excimer laser is an alternative treatment carried out on patients with recurrent erosions. As this creates a large area of superficial ablation, the procedure minimises the effects on refraction and can also be used to correct myopia in refraction at the same time.